It’s hard to think of the desert heat right now, when I’m up to my wrists in flour, ground up candied rum-soaked fruit and icing sugar. Where is the sun? Where is the snow? It’s raining – not conducive to sustaining a Christmas spirit. Mutter, mutter…. My baking is done – three carrot/apple/cranberry Christmas cakes, lighter that traditional fruitcake and redolent of warm spices and a dark run soak. I know I have a package of almond paste around here somewhere, but I can’t find it. Sometime in May, when I’m cleaning out the cold room or the second fridge or the secret stash of stuff I put away for a rainy day, I’ll locate it. Of course, it will be even harder than it is now, a pale yellow oblong of almondy brick-ness that I’ll consider grinding up, but will have no immediate use for. Guess I’ll make do with cream cheese icing swirled with freshly toasted and ground apple pie spices. 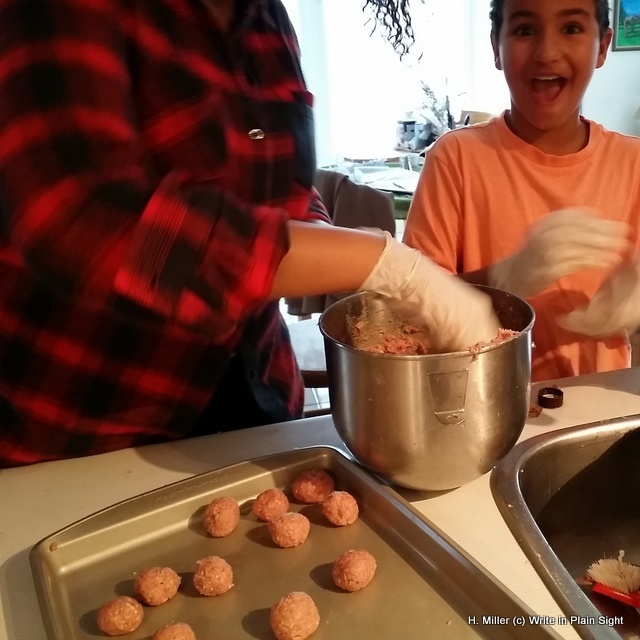 We made 100 meatballs for our Christmas Eve Swedish smorgasbord. Of course, with multiple tastings, the inventory was much reduced. I’ve already done two runs to Bulk Barn for dark brown sugar, whole red peppers and white peppers. Toasted up the peppers, mixed them with kosher salt, white and brown sugar, cut up a bunch of fresh dill and slathered a thick, rosy oblong of fresh salmon with the mixture before binding it all up in Saran wrap. Gravlax in the making, to be served with fresh horseradish cream sauce for our Swedish New Year’s eve party. The salmon is oozing nicely. 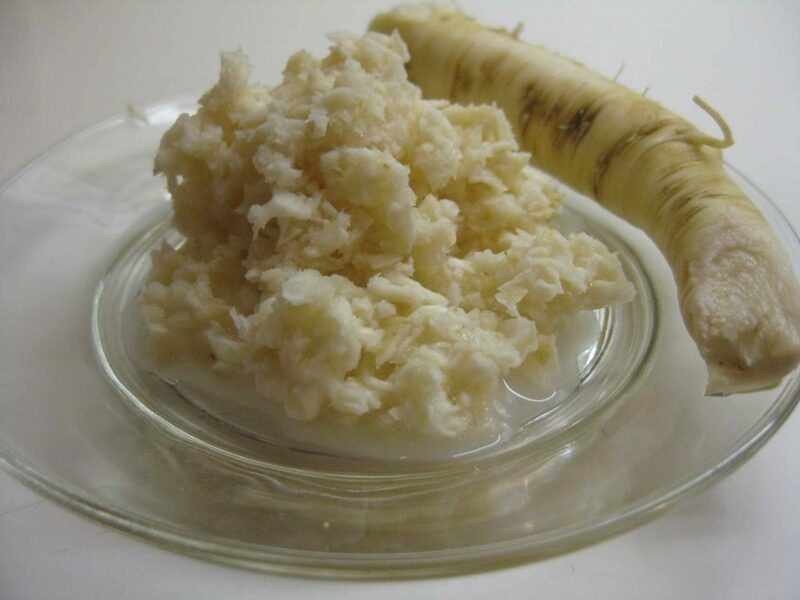 I dug up a couple pounds of horseradish from our garden in late October because I’d almost forgotten about it. The ground was already beginning to get hard and I managed to whack myself in the shoulder with the shovel. The grandchildren helped cut up the ugly roots and I pulverized them in the Vitamix. Stupid me. I stuck my nose into the container for a sniff and almost dropped to my knees, overcome by the overwhelming sharply pungent stink. Damn, but it sure did burn. All of us were wiping our eyes and laughing like maniacs. We’re thinking of making YouTube videos – Wild Times Cooking with Grandma. Thank goodness we were wearing kitchen gloves – the ground up horseradish would be better than pepper spray for subduing bad guys. But once we poured in some white wine vinegar and smooshed the mixture up some more, the result was a nice creamy sauce that will lift the roof off your mouth is you take too much. Once I smooth it out with whipping cream and spices, that ugly stinking pile of stuff should mellow nicely. Now I’m off to brine the bird. The aromatics for the stuffing are done. I’ll get one of the kids to grind up the bread later while the other two are styling the table for tomorrow night’s dinner. Once the food prep is done, then the cleaning starts. My least favourite part of the holidays. The roads are crazy busy but I have to get some fresh mussels and lobster for the Västkustsallad (West Coast Salad) – pretty food and very tasty. One of the gifts I bought for my granddaughter – a dancing water USB thingy that she attaches her iPhone to – is now a duplicate after her Secret Santa with high school friends. Grr. I’m not going to the mall, though. Gift cards – yeah!